The first was a third-and-six catch by Hopkins in which he pretty clearly didn’t get two feet in — probably not even one foot — but Fox held on to the challenge flag. That drive ended with a touchdown pass to Hopkins. It should’ve ended with a punt. The next was the quarterback sneak by Brock Osweiler in which Osweiler very clearly didn’t even get back to the line of scrimmage. It wasn’t even close. 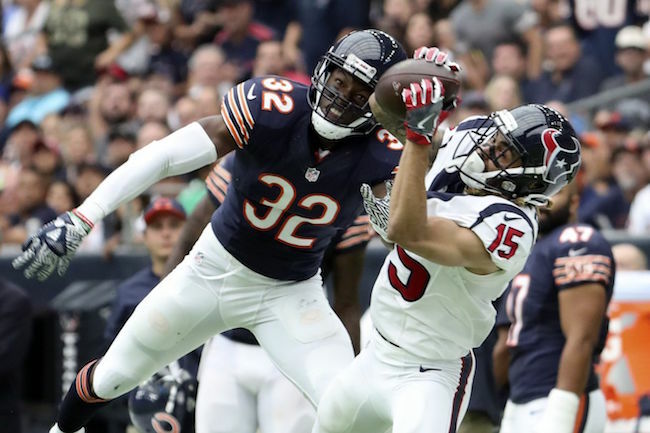 A few plays later, Will Fuller made fools of the Bears defense for a touchdown. While NFL replays can often be a crapshoot, I don’t see anyway those calls would not have been overturned. But Fox didn’t challenge. That cost the team 11 points — assuming a made field goal on the second one — in a game they lost by nine points. Hell, even if they weren’t overturned, they were both worth a challenge. The Texans only asked Will Fuller to do one thing: be fast. They ran him deep and got him in space. That was it. Why didn’t the Bears try to do the same with Kevin White? White is just as fast as Fuller, but a few inches and several pounds heavier. He’s a beast with the ball in his hands, but the Bears didn’t even try to get him in space. Ask him to do what he did well at West Virginia and build on it as you go along. White has his issues. He showed them on the third quarter interception when he committed the cardinal sin of fooling his quarterback. But it is the job of the coaching staff to play to their strengths. White’s is that he’s freakishly big and fast. Let him be that and worry about the rest later. History suggests that if the Bears had Robbie Gould as their kicker, they would’ve had six more points on Sunday. With momentum on their side, Fox uncharacteristically decided to go for it on fourth-and-one. Although the play call was dumb, I admire his aggressiveness and thought it was a sign that the team was going to be more aggressive this year. We learned otherwise later in the game. The Bears had a fourth down from Houston’s 38 later and Fox elected to punt it instead of attempting a 55-yard field goal, indoors, with the team ahead by a point. If you have a decent kicker, you kick the field goal there. But the Bears couldn’t even consider it. Robbie Gould was a weapon last year and Fox knew it, attempting nine field goals of 50 yards or more. Gould made seven of those kicks. Given the perfect conditions in Houston, there’s no reason to think he wouldn’t have made two last Sunday. But the Bears don’t have Gould. They have a guy who is only reliable when their red zone offense doesn’t come through. I get the decision to replace Gould. I don’t understand why they replaced him with Connor Barth. • The lack of pass rush from Willie Young really stood out as I didn’t have him with a single hit or hurry on Brock Osweiler. • If the Bears are going to get the most out of Akiem Hicks, they’re going to have to cut his snaps in half. Throughout his career, he has been at his best when he has played about 40 percent of his team’s snaps, he was at 82.7 percent on Sunday and was completely ineffective. • Due to the birth of my son, I haven’t had time to chart the Bears’ offense yet, but I can tell you their offensive line wasn’t good. But I’m not worried about it because they were using a new starting five against arguably the best pass rush in the league. It was a bad matchup.